This semester in Professor Lisa Mazzie’s Advanced Legal Writing: Writing for Law Practice seminar, students are required to write one blog post on a law- or law school-related topic of their choice. Writing blog posts as a lawyer is a great way to practice writing skills, and to do so in a way that allows the writer a little more freedom to showcase his or her own voice, and—eventually for these students—a great way to maintain visibility as a legal professional. Here is one of those blog posts, this one written by 2L Mitch Raasch. In Products Liability class with Professor Kircher this semester, we often discuss manufacturing and design defects and companies’ requirements in making safe products. Since starting this course, I have often found myself analyzing news stories for potential products liability cases. So, when I read about last week’s tragic incident in which a woman died after an engine in a Southwest Airlines plane exploded, I naturally thought about the potential liability that multiple parties might face. 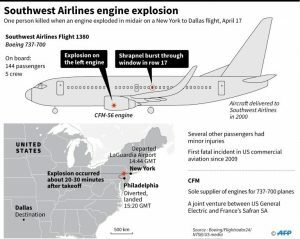 The Southwest airliner was a twin-engine Boeing 737 travelling from New York to Dallas. One of the windows was struck by debris from a blown engine, causing passenger Jennifer Riordan to get pulled partially out of the opening. She later died from her injuries, and seven others were injured. The last passenger death on a U.S. commercial flight was in 2009, so the amount of media coverage the incident has garnered comes as no surprise. Nearly all of us have flown commercial, and we expect that each aircraft has gone through in-depth inspections prior to takeoff. But are engine makers and commercial airliners fulfilling their duties under the law? The National Transportation Safety Board (NTSB) said that a preliminary examination of the engine showed evidence of metal fatigue, but that a full investigation will last up to fifteen months. Debris from the engine, which is manufactured by CFM International, should have been prevented from flying out by the engine’s metal cowling. There are a number of different possibilities as to why the metal cowling failed to operate as it was intended. The NTSB will look into the design, manufacturing, and maintenance of the engine. Likely, it is a combination of these factors that is to blame. Similar accident evidence will be key in determining liability. As recent as 2016, a Southwest Boeing 737 blew an engine and shrapnel tore a 5-by-16-inch hole above the wing. That incident might be significant when analyzing what Southwest has done to prevent accidents like this one. On Friday, CFM recommended inspections on fan blades in engines that have been used in more than 30,000 flights, and the U.S. Federal Aviation Administration (FAA) and European Aviation Safety Administration made the inspections requirements. The inspections must be made within 20 days. CFM also recommended inspections by the end of August for fan blades with 20,000 flights, and repeated inspections thereafter every 3,000 flights. With approximately 14,000 of these CFM engines in operation, this will be an expensive process. As CFM scrambles to inspect its engines, engine makers and airlines are undoubtedly a bit shaken by the Southwest accident. Passengers on that Southwest flight will likely evaluate claims for defective design and/or manufacture of the engine against CFM. CFM might argue Southwest misused or abused the product. For strict liability, a plaintiff can recover without a showing of fault. They must still prove the product was defective at the time it left the defendant’s hands, the product was used in a foreseeable manner, and the defect was both the cause in fact and proximate cause of the injury. Given that there are other similar incidents with CFM engines, a negligent design claim, which attacks the entire product line, appears to be a viable claim as well. No matter the ultimate outcome of the litigation in the wake of this tragic accident, I hope that airlines and engine makers take greater precautions in inspecting engines that are potentially hazardous to passengers. Previous Previous post: Our May Bloggers Have Arrived!